As is typical, Savant no sooner finished making a blanket negative statement about MGM composer-biography musicals than I ran into Three Little Words, a winning confection that makes all the faults of the subgenre seem like sterling qualities. This time out the subject is the songwriting team of Bert Kalmar and Harry Ruby. As fictionalized as the other musical bios, Three Little Words winning cast charms us completely. Dancer Bert Kalmar (Fred Astaire) fumbles his duo act with Jessie Brown (Vera-Ellen) because he has an unrealistic notion of becoming a magician. She turns down his proposal and they go back to dancing together until Bert hurts his knee. This time he turns down her proposal and instead teams up as a lyricist for Tin Pan Alley composer Harry Ruby. When the two men hit it off and their songs and shows sell, Bert and Jessie reunite and marry, and try to guide Harry away from troublesome women like singer Terry Lordel (Gale Robbins). Agent Charlie Cope (Keenan Wynn) helps with this deception, and also helps Harry steer Bert away from a bad play he's written. Harry eventually weds movie star Eileen Percy (Arlene Dahl) but an argument results in a 5 year split between the partners. Can Jessie and Eileen get the boys back together? Three Little Words doesn't sound special on paper but it is -- the script and the actors take the story of the off-again on-again partners seriously, and although the differences that divide them are mostly made-up, we get a good sense of the nature of work in Tin Pan Alley work. One person has a tune that needs lyrics, or the other has words and no melody. They work out their songs together, or separately. The framing story in this musical bio is more interesting than most. Astaire's Bert Kalmar loses his girl Vera-Ellen for a spell because he can't focus on one thing long enough to decently propose; later on he sends her away out of selfish concern. Happiness and success always go hand in hand in these pictures, and the pair only get together when they've decided on the proper course -- he writes, she stops dancing to become a housewife. The supposed incompatibility of marriage and careers is demonstrated in a "dancers at home" number. Hubby and wife toss their baby around like a football and destroy their house by dancing through a wall. Vera-Ellen isn't highly praised as an actress but I think she shines here -- in the first scenes she regards the immature Astaire with an affectionate intelligence, and comes off as a less perky Mitzi Gaynor, or a more insightful Barbara Rush -- a whole woman as opposed to the "types" that would soon be dominating 50s screens. Fred Astaire's role is interesting too. Something in us becomes immediately concerned when he has knee trouble and can no longer dance. We feel diminished -when Fred is recovering on a chaise instead of bouncing around the room as he did in so many musicals before. The world isn't going to be right again until he dances. We do get a couple of scenes of Bert dancing again but are shown that his bad knee persists ... and indeed his dancing is soon limited to expressions of affection between him and Vera-Ellen's Jessie. Come to think of it, they rarely kiss. Instead of proclaiming his love, Kalmar writes her a love song. It becomes one of the team's biggest hits -- this is the world of musicals, of course. It's also interesting to see Red Skelton in a light dramatic role. Always a good clown, Skelton comes off as sort of a Randy Quaid type, working hard to find melodies. Skelton's Ruby comes off as a romantic sitting duck for a couple of users, notably Gale Robbins' unfaithful redhead. Although Ruby's benign interference in Kalmar's business plans (the supposedly bad play he's written) initiates one of their break-ups, Bert and Jessie never fess up to manipulating Harry's love life, which they do in a much more offhand manner. What if the snobby woman on the boat is really Harry's correct soul mate? He ends up with another redhead, the classy Arlene Dahl (Slightly Scarlet, Journey to the Center of the Earth), a woman more compatible with the Kalmars' taste. 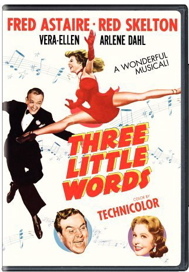 Three Little Words has pleasing musical numbers that don't strain themselves trying to top earlier films. There are no showstoppers, only familiar standards and graceful dances interrupted by amusing lighter material. Fred Astaire and Vera- Ellen are wonderful together, perhaps even better than the Vera-Ellen Gene Kelly teaming in On the Town, which comes off as more of an athletic workout. Astaire makes his dance partners seem lighter than air ... literally. Vera-Ellen's singing is dubbed by Anita Ellis, while Arlene Dahl sings for herself. The movie takes the liberty of pretending that its title song kicked around incomplete for years before finally coming together to help the Kalmar -Ruby team affect a reconciliation. That's total hooey, but it comes off as smooth and unforced in the movie. Two numbers feature notable guest players. The novelty song "I Wanna Be Loved By You" is the first film appearance by the teenaged Debbie Reynolds, doing a spot-on Helen Kane imitation. The real Helen Kane does the Boop-Boop-a-Doop vocals. Kane's story is a lesson in copyrights: She lost a lawsuit against Max Fleischer studios for lifting her flapper persona and voice for Betty Boop cartoons. Seventy years later the singer is forgotten, her individuality usurped by a cartoon character. Reynolds does well singing and vamping around gangly Carleton Carpenter. They were obviously paired because they were cute and asexual - even though she twists his shirt front into a knot and tugs at it in a way that now seems highly suggestive! The other guest star is Gloria DeHaven, who plays her own mother (billed as Mrs. Carter DeHaven) singing "Who's Sorry Now?" Of all the MGM juvenile stars DeHaven always seemed the most expendable ... either that or she just didn't get the right breaks. In an earlier musical she's outshined by June Allyson and Nancy Walker, although she's much prettier than either of them. Keenan Wynn does well as an agent with a knack for saying the wrong thing. We're told that if we look closely we can see young Billy Gray (The Day the Earth Stood Still ) in a street scene and Beverly Michaels (Wicked Woman) on the ship coming back from England ... the ship where Harry Ruby enjoys a stateroom the size of a tennis court. Warners' DVD of Three Little Words is a fine restoration, with only a blip of misregistration here and there, and a few bits of dirt. The original mono mix sounds strong and hearty. The unattributed interview docu Three Little Words: Two Swell Guys gives a fair overview of the picture using a pair of authors well-attuned to the DVD featurette format -- everything they say is bite-sized and punctuated for maximum effect. The 16:9 show frequently enlarges and crops shots from the movie, making them look exceedingly ugly ... if that effect is necessary, it would be wise to re-convert the HD master to NTSC for these shots on an individual basis. On the other hand, doing it this way avoids the problem that occurs on some discs (not this studio's) with clip-oriented docus: Due to different bit rates in the encoding, the clips in the featurette can end up looking better than the feature. The extras begin with a trailer and a radio promo, and end with two featurettes with tenuous relation to the host movie. The Tex Avery cartoon Ventriloquist Cat may have come from the same year, but Fitzpatrick Traveltalk: Roaming through Michigan looks like it comes from the late '30s and doesn't connect at all ... neither Kalmar or Ruby come from that state. 1. I wonder if Buster Keaton helped out with any of these baseball gags. They were his specialty and he often did gags for Red Skelton movies. None of these jokes look like they needed genius Keaton input, though.